Many of you come to me struggling with perfectionism – often it’s the perfect diet, the perfect weight, or the perfect body. And when things aren’t exactly the way you think they should be, you say you are a ‘total failure’ and that you are ‘completely out of control’. When I ask what you mean by ‘out of control’, answers consist of anything from an ‘unplanned’ piece of cake, to one missed workout in the week, to a gruelling pattern of rigid restriction sometimes followed by bingeing and vomiting. No matter the definition, any deviation from perfect is experienced as a complete disaster. This drive for perfection is not limited to your food and body concerns, but spills over in waves into other spheres of life such as expectations in love and in your job. Whatever the domain, the idea that anything other than perfect will do seems to have permeated many a modern woman’s psyche. 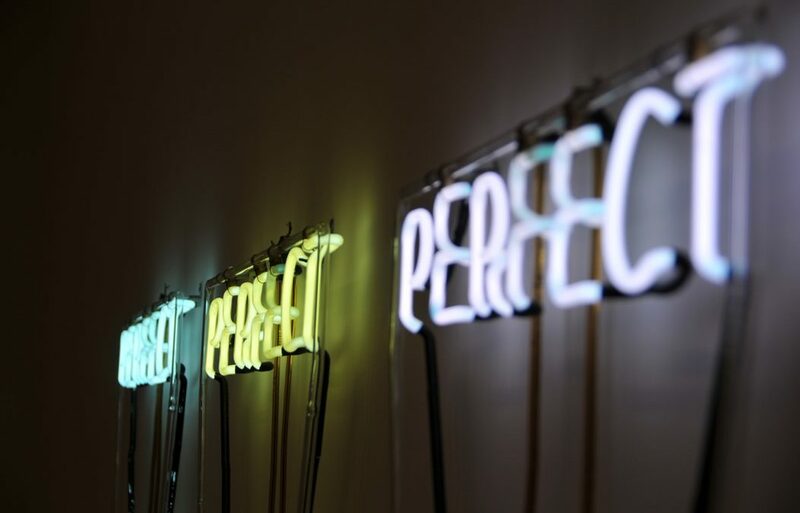 The thing is, the word ‘perfect’ derives from a word meaning, ‘done, finished, or complete’. Who, in the world, is PERFECT? Complete? Beyond improvement? Free from any flaw? Whose life is like this? Whose body is like this? Fashion, magazines and social media have endeavoured to ‘Photoshop’ our collective consciousness into believing that such a person, body and life exists. Supermodels and celebrities have flaws too – they are just airbrushed out. Before they post their social media update, they have specialist make-up artists and professional hair stylists on hand to help them look “photo ready”. Check out this video by Dove which taps into the façade. When we see these images, we assume the way these models look is the way they live and love, but I challenge anybody to show me such a person or life. A “perfect person”. “Perfect” simply does not exist. If you want to step away from feeling the pressure to be perfect, follow my simple methods below to help yourself stop the endless desire to make things perfect and gain back a sense of real control. 1. Tell your inner perfectionism bully to shut up! Becoming aware of that voice that tells you these things – that you’re not good enough, or your body isn’t right, is a good place to start. Create an image of that voice so you can see it outside of yourself. Imagine what it looks like. Name it! Imagine that mean version of yourself standing there in the room with you shouting those abusive messages. And then tell it to SHUT THE HELL UP! Would you speak to your best friend in the way your bullying voice talks to you? Instead, speak to yourself in the way somebody who loves you would. 2. Acknowledge the concept of being GOOD ENOUGH. Being “good enough” to some people means being the same as a failure, as being average. A lot of people I work with struggle with that phrase. What does that bring up for you? Could it be not standing out from the crowd? That you’re boring? Being good enough is not about being average. It’s about feeling good enough. You can be good enough in some areas of your life and excel in others – that’s ok. We can’t all be experts in EVERYTHING. You are unique because you are textured, beautiful and interesting. No one else has the same combination of qualities. Just you. 3. Strive for what is possible. In order to feel more at ease, and stop yourself being consumed by overwhelming feelings of failure, you have to strive towards something that is possible. Don’t set unrelenting standards for yourself. Stop for a moment and think about what you’re demanding for yourself. What is possible for YOU? How can YOU be your best self? What are the most important things to you? Who do you want to be? What do you want people to remember you for? Set goals that are both realistic and consistent with your values. Small achievements make you feel good about yourself. Always coming up short of impossible ones is guaranteed to leave you feeling out of control. 4. Accept that your bodily “flaws” are what makes you a human. Nobody is without “flaws”. The body is made of flesh and blood. It will grow old and it will get sick. It will bleed, it will scar, and eventually, it will die. Your “flaws” – or what others think are flaws – are what make you human. Coming to terms with those parts of your body means thinking about all the positive reasons you have them. It could be that those stretch marks are signs that you have produced life, if they came from pregnancy. Or scars are signs that you have survived. Think about what your body has DONE for you. Have those thighs run a 10K, or even a marathon? Have your legs carried you up a mountain? Be PROUD of how capable your body is. If you worry about your ‘flaws,’ spend some extra time when you are getting ready in the morning on those areas that you don’t like. Wash them more carefully. Moisturise them a little longer than you would normally. Speak to them the way you would do if they were part of the body of someone you loved. You might not believe these words at first, but over time, you can change the way you see your beautiful, unique self. Real life is ever changing and unpredictable. Human beings are full of love and joy, but each one of us has our shortcomings. The more we focus on those shortcomings, the more we miss the positive things we are achieving and can celebrate. The more we strive for perfection in our eating, the less we see how our diets are good enough. If you are spending your life comparing yourself to seemingly ideal lives and constantly trying to achieve the impossible, is there any other way you could feel, other than that you are failing, that your eating is out of control, that your body is “wrong” or that you aren’t good enough? In short, a person can never be finished or complete. A perfect person is IMPOSSIBLE. You’re doing a great job, just the way you are. If you’re struggling to silence your inner perfectionist and it’s starting to get in the way of leading a meaningful life, then please click here to get in contact with us today for a chat about how we can help.